Its still a tad warmer than it ought to be at this time of year. So I was hesitant about planting my 750 spring blooming bulbs. Timing is everything. Too early and they start putting out shoots right away; too late and the ground is frozen solid. In the past, I’ve always planted round about now. I did spot a solitary woolly worm ( caterpillar of the tiger moth) but couldn’t remember what the brown band meant at that time. Only later did I recall that a narrow brown band means a harsh winter. The one I saw bore a band almost half the length of the worm. I’ll make up my mind about this prediction in March 2013. Uncertain of when it might get properly cold, I decided to take the risk and go ahead. Besides, my able bodied albeit reluctant helpers (husband and progeny) were free to assist. Like I just said – timing is everything. Each year the planting gets harder. A rather harsh reminder of aging body parts. 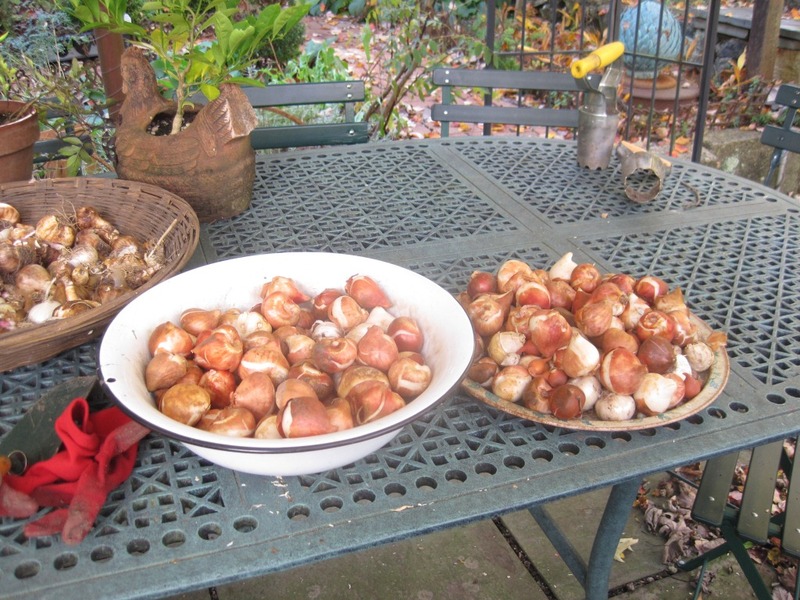 Whilst sorting the somewhat large number of bulbs for the respective areas of the somewhat small garden, I was appalled not only by the greed that had prompted this order but also how insane I’d been to take on such a project. I never learn. Like childbirth, I forget the pain and giving no consideration to budget or aforesaid aging body, I keep repeating this laborious project. First, I set up my helpers with their stash of bulbs and assigned them their areas in the ‘meadow’. Over the years they know what to do. Still, not wanting to take chances, I gently remind them that each bulb goes in to a depth three times it’s size (and ignore the teenager rolling her eyes). I treat my aides very kindly because as one well knows, good help is hard to come by. Frankly, I cannot dream of planting the bulbs without their assistance. I am careful however to not mention this as I’m afraid they might demand better work conditions and actual salaries. I myself have the toughest area in which to sink in the bulbs. 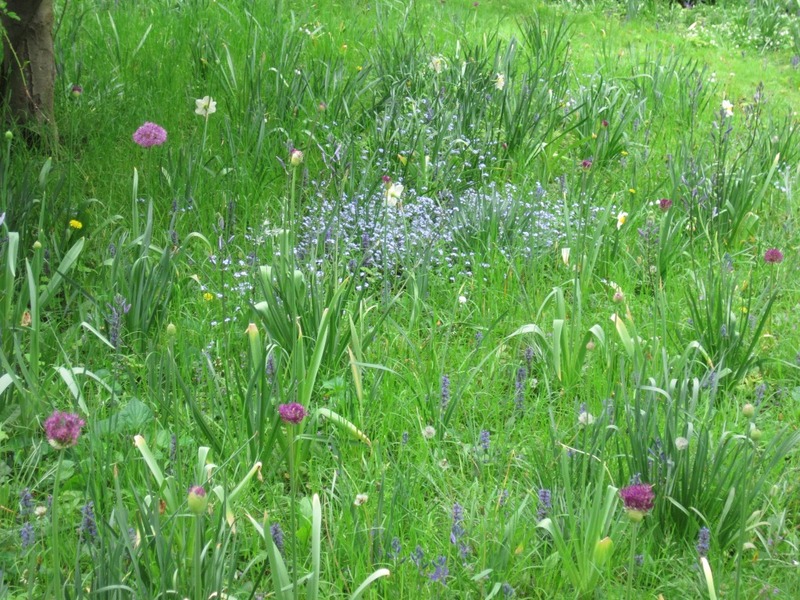 The two perennial beds in front are a challenge as they are chock full of perennials and bulbs from previous years. The odds of hitting a spot already safekeeping a bulb are very high. I’m understandably nervous about rendering a body blow to a precious allium, crocus, hyacinth, ornithogalum, galanthus, muscari, lily, anemone blanda or camassia. Then there’s the fact that I have to dig each hole while contorting my body unnaturally so as not to step on the ornamental grass, asters, monkshoods and sedums currently in bloom and at the same time avoid the frenzied bees swarming around to siphon nectar from said plants. Its like I’m playing a version of Extreme Twister by myself. Teenager at work. Warms my heart! Counter-intuitive as it may seem, I’ve decided that its harder to work with the very small bulbs. Easy enough to make the holes but grasping and placing these bulbous miniatures right side up is not so simple. I think little children should be put to work for this task. Their small hands are perfectly suited. 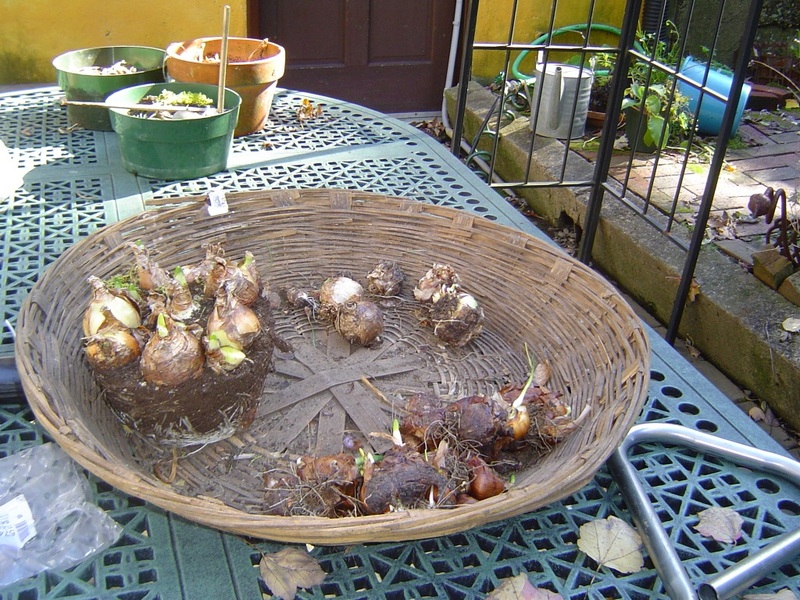 Small bulb planting in exchange for some ice-cream sounds pretty commensurate don’t you think? Plus they get to relieve some pent up energy and breathe all the fresh air their young lungs can take. And in the spring, they can be very proud of the beautiful flowers for which they were responsible. I fantasize about starting a business of hiring out well trained youngsters. I could be the equivalent of a modern day, reformed Fagin. Its productive thoughts like these that keep me plugging away. Finally, the bulbs are all in. A thick layer of compost to function as both fertilizer and mulch is applied all over the beds. I am done! However, the worst is yet to come in oh, about twelve to fourteen hours. That’s when muscles I forget about all year long decide to express themselves. Bending, the act of sitting, walking up or down an incline or stairs are all excruciatingly painful. To make matters worse, every groan elicits laughter from those home grown helpers of mine. They appear unscathed and annoyingly perky. Maybe I’m treating them much too well. 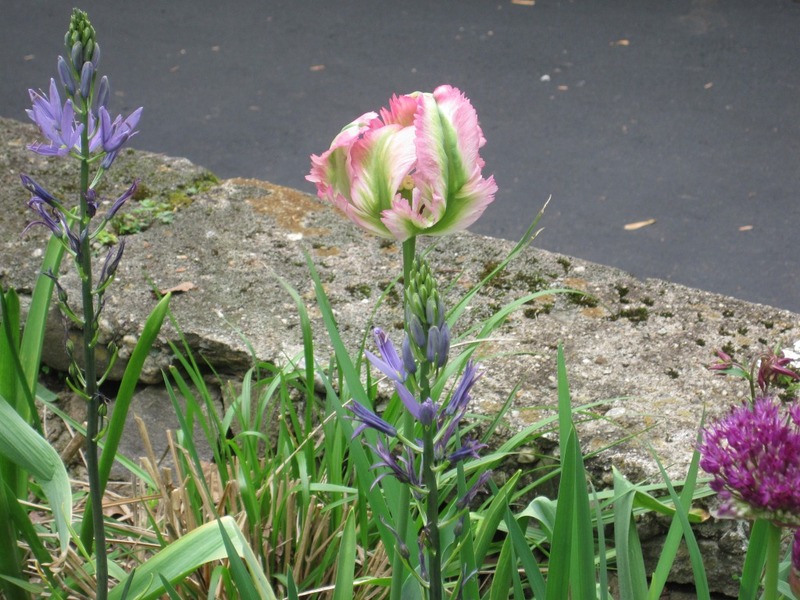 Parrot tulip and camassia. From last spring. More bulbs in perennial bed. If the weather shows promise of staying warm for a few days longer, remove the leaves shading the unripe fruits. This will allow more sunlight on them and hasten the ripening. Alternatively, pluck the green tomatoes and wrap each one in newspaper. Store these ‘packages’ in a single layer making sure they’re not touching, in a cool, dry place. The tomatoes will ripen in a few days. Check periodically so they don’t spoil. Finally, there is always the delicious option of making fried green tomatoes. Yum! As I’m getting ready to put this post up, we’re battening down the hatches in preparation for Hurricane Sandy. I don’t mind the end of season garden chores as they needed doing anyway – just not in such a frenzied hurry. But all that could be done is done. With still so many leaves on the trees, I fervently hope the storm is not as bad as the predictions. Lets all keep our fingers crossed and think positive thoughts. Stay safe! Have you ever had the experience of encountering a place that immediately finds a home in your heart? When you feel inspired and energized by the promise it holds? On the morning of October 5, 2012, thats exactly what happened to me. 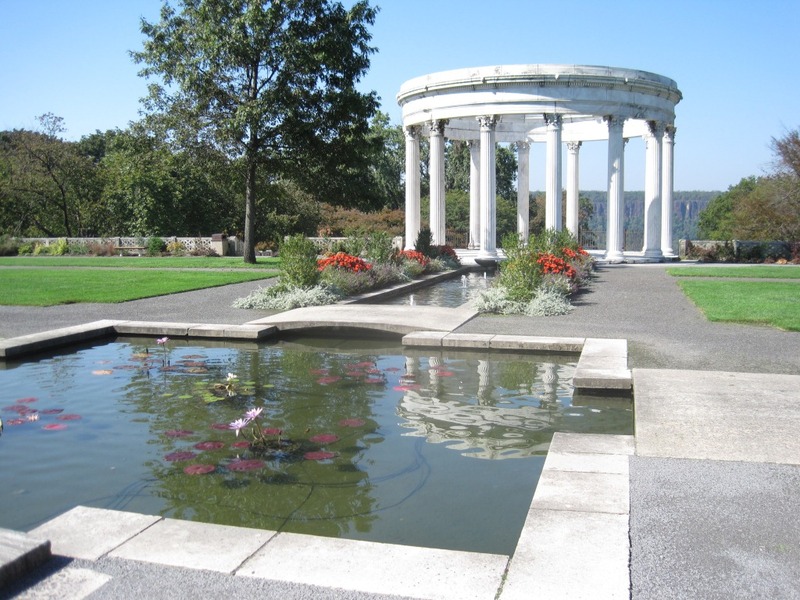 That was the day I was introduced to Untermyer Gardens in Yonkers, NY. Until a year and a half ago, I had never even heard of the place. Then my friend and horticulturist extraordinaire Timothy Tilghman, took up a job there. I was made aware that the garden had flourished in the early half of the last century and then went into serious decline. It was all but forgotten while weeds smothered the place and vandals went about wrecking it. I hoped Timothy knew what he had accepted. It wasn’t just the job of maintaining this garden but he had to first bring it to life. Thats more than mere application of horticultural knowledge. It takes great vision, curiosity and passion. 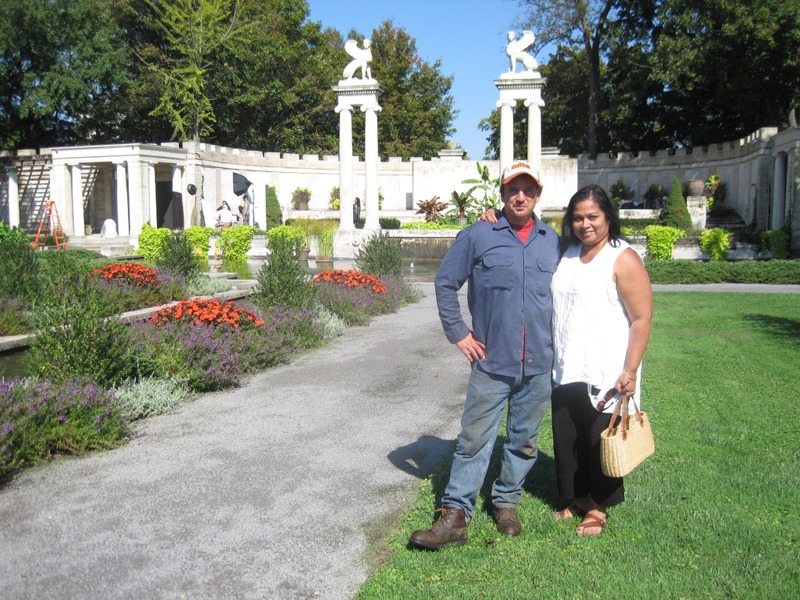 Through mutual friends and mainstream media coverage, I followed Timothy’s spectacular progress at Untermyer. I kept intending to visit but life has a habit of getting in the way and it wasn’t till this particular October Friday that I finally got there. On this bright, beautiful day, Timothy waited to show me his ‘baby’. 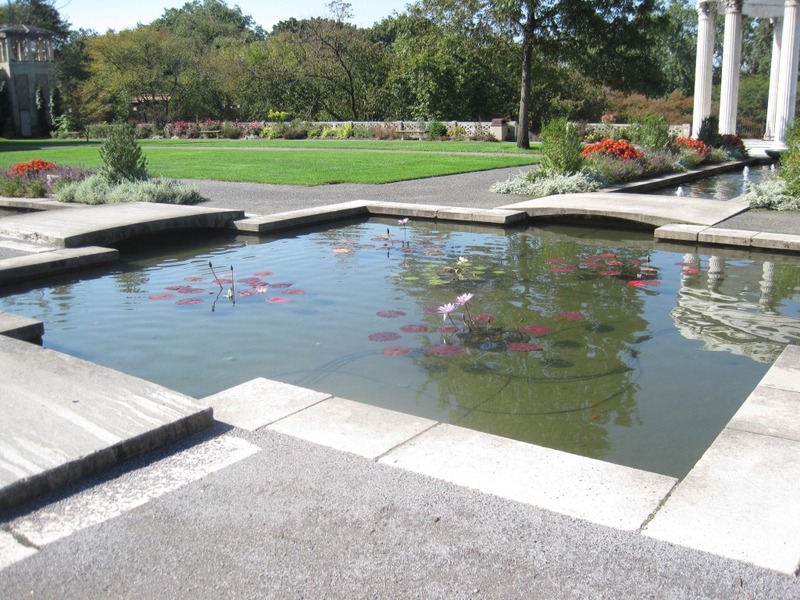 There is plenty in the archives to give the original plans and making of the original gardens that Mr. Untermyer himself oversaw and created. So I shall not go into the history and other details. 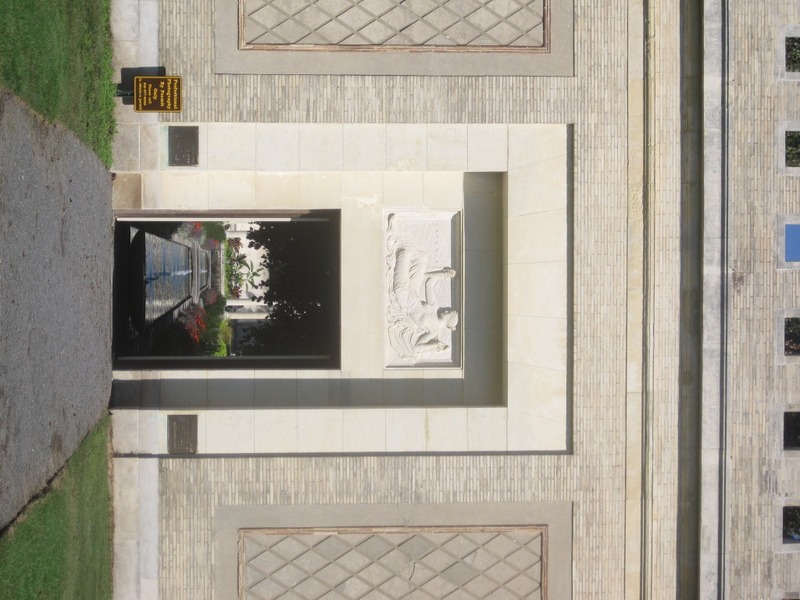 But I strongly recommend that one go to the website www.untermyergardens.org. to learn more as well as to see photographs of then and now. I assure you it is worth the time and effort. What I want to convey here is my personal response to this garden. Spying the walled garden through the tall doors set in a high, crenelated wall is a real tease. One is lured in. 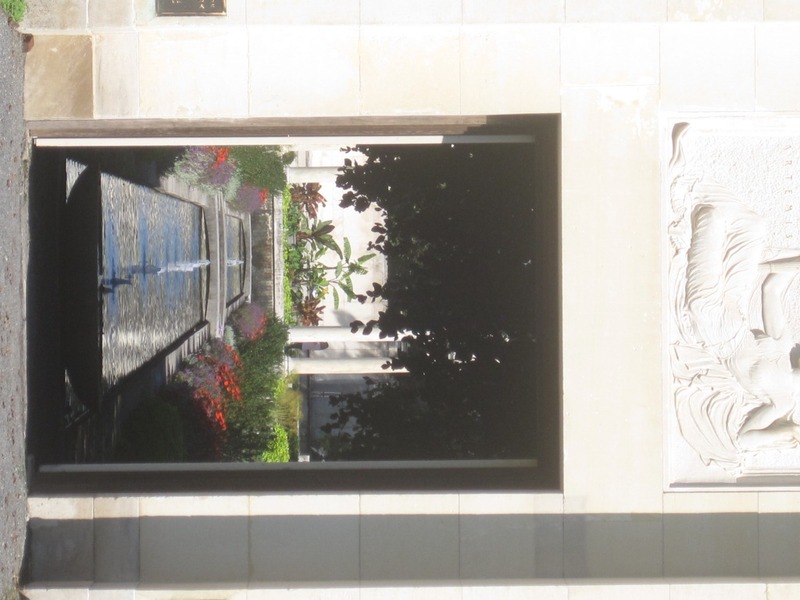 It is entirely possible that on entering this garden and seeing the Persian/Mogul inspired design, my own Indian heritage influenced how much at home I felt. It was as though I was visiting an old royal garden in northern India. But it was more than that. It felt right. 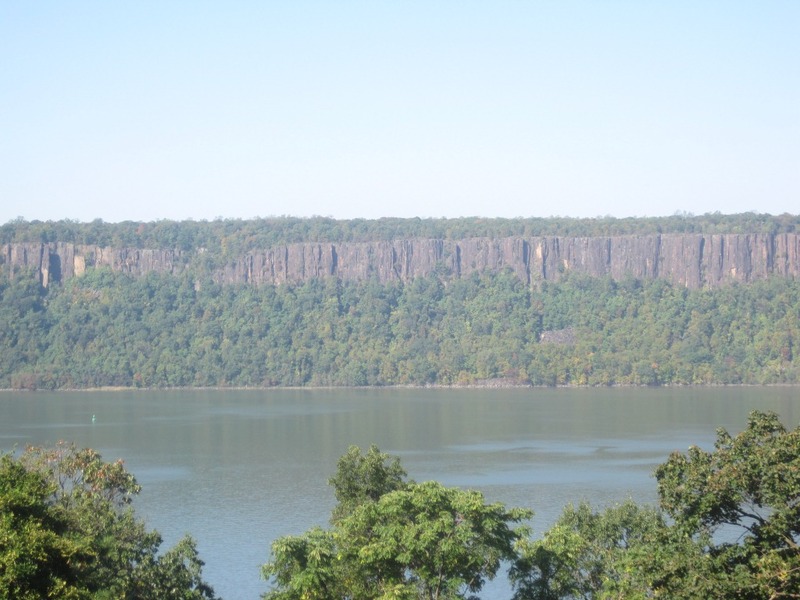 Perched across from the Palisades, overlooking the Hudson river, this garden was situated carefully and deliberately. The designer had known exactly what he was doing. Which brings home the point that for a garden to be a true success, it must not only be laid out well but it must be assigned to the appropriate site. The plantings are just lovely. Dramatic and yet, they do not compete with the strong bones of the garden. Even in restoration, a garden must evolve. Timothy has selected plants that are visually really attractive. On closer inspection they reveal how clever he has been in his choices. The Japanese hollies with New Guinea impatiens bordering the water canals are spot on. Elsewhere, he’s used plants that are hard working and easily obtained. Anybody can try these plants in their own gardens. I got the distinct feeling Mr. Untermyer would’ve approved. 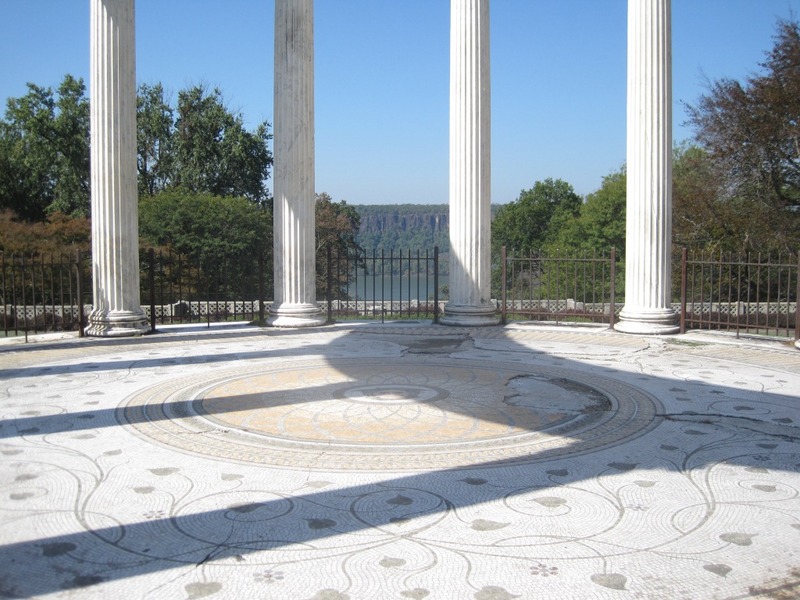 And thats what makes Untermyer such a wonderful classroom for all gardeners. 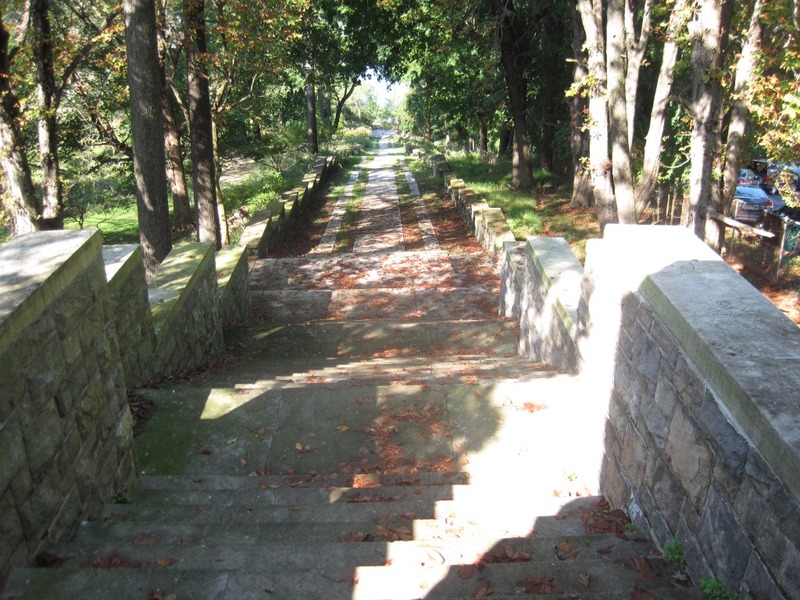 The original plans are available to show how the owner along with landscape architect/designer Welles Bosworth created the various gardens with care and purpose. There are photographs and other information available for study and they provide a wealth of answers to the myriad questions that Timothy must ask in order to restore all of the gardens to their former state of glory. His progress will be instructive at so many levels. After showing me around the walled garden and allowing me sufficient time to drool over it as well as the mosaic pool set just below to its side, Timothy led me on a horticultural adventure. The initial discovery of various ruins and debris after clearing decades of overgrowth had been absolutely thrilling for him. Now he could match photographs to actual locations on the property. His joy in showing me all of what he has unearthed and what still remains to be done was contagious. 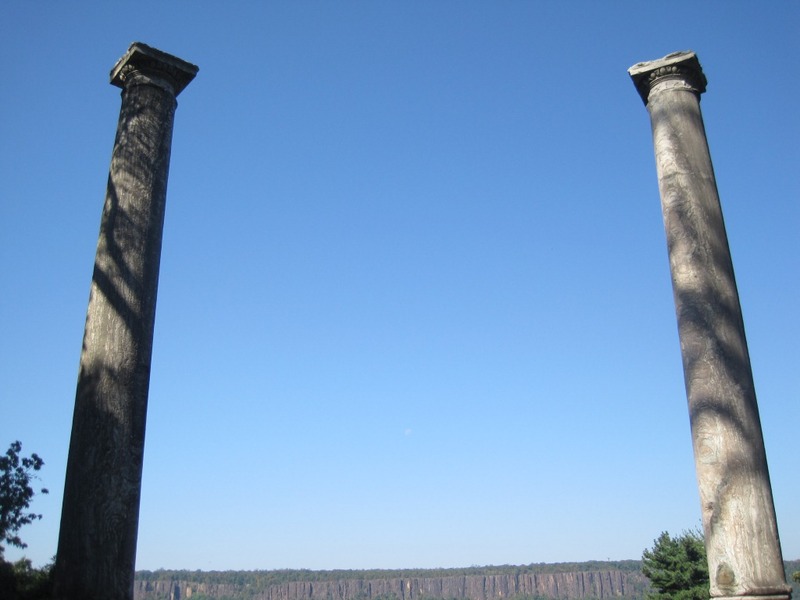 Whether it was the authentic Roman pillars or the old carriage trail or the rose arbors or where the daffodil drifts explode in spring or the Temple of Love, I was caught up in the excitement of coming upon the remains and envisioning them at the height of their times. This was history, archeology, architecture, horticulture and The Secret Garden all rolled into one exhilarating experience. An astounding amount of work still remains to be done but what has already been achieved is just as impressive. Here is a garden brimming with such potential and possibilities. It absolutely must be restored or we will lose one of our nation’s great gardens. 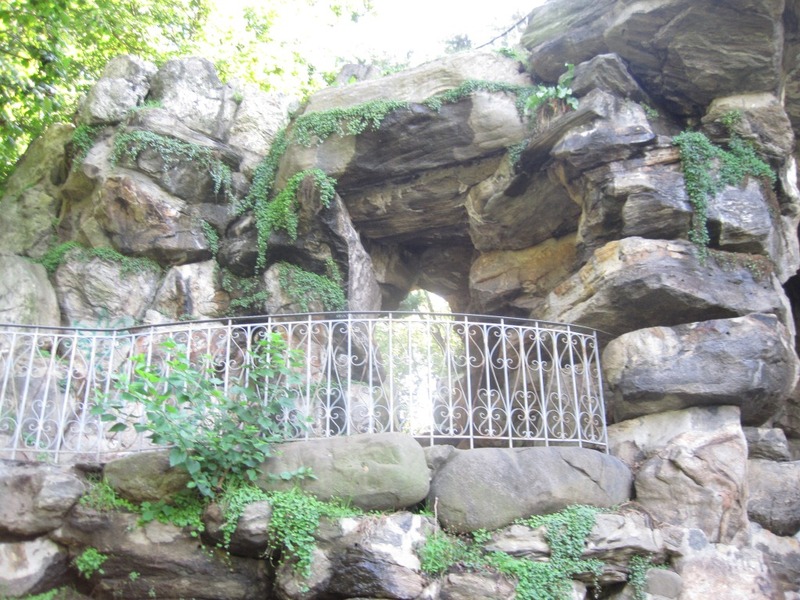 There is an Untermyer Conservancy to which donations can be made. And while one waits for funds to roll in and the work to be done, word about this treasure must go out, visitors should come and all together we can bring this garden back to the way it ought to be. We owe this to ourselves and to generations ahead. I’m already planning future visits when I can paint en plein air while at the same time acquire new gardening wisdom. A viewing place. There used to be a waterfall here. Once again, its time to start putting the garden to bed. Sigh. Looking at spent up plants, fallen leaves and worn out lawns, I’m acutely reminded of the long, dark winter months ahead. I’m overcome with a sense of sadness and a reluctance to let go of light cast days of summer. I regret the time wasted by shirking duties in the garden. When I escaped too quickly into the air-conditioned comfort of the house mumbling the excuse of wilting in the humidity. Why instead, didn’t I accept that it was okay to sit outside and still not do the chores? At least the pleasures of the outdoors could have been indulged. But no, I could not look the garden in the eye when I failed to tend it properly and so I skulked away. What a loss of good summer hours. With the heavy heart of one saying goodbye to a very dear friend, I start on my chores. Soon, I’m filled with optimism and anticipation of our next encounter only a few months away. I’m suddenly aware that the tasks themselves are full of promise. Consider the seed pods ripening on the stems. While they dry and make percussion music in the breeze, they hold everything to make more plants for the next time around. Tomorrow will offer abundance. I harvest the pods and tuck them away in labeled envelopes till its time to awaken them at the end of winter. Already, I’m planning exactly when each type of seed will be started. My heart beats a wee bit faster. Cutting back the perennials and pulling up the annuals allows me the satisfaction that comes from cleaning and tidying. The perennials go dormant and I imagine them replenishing their energy to emerge again in the spring full of vim and vigor for yet another year of giving joy. Dividing perennials like peonies and irises at this time provides the opportunity to expand the garden with more of what I love. I add other treasures from the nursery. When I’m finished, it doesn’t look like much but I know that after the winter, the garden will come alive bigger and better than before. My heart beats even faster. I’m smiling as though its already spring. Planting a tree in itself is an act of faith. Particularly if it is a tree that grows slowly and grows big. I myself may not be there to see it in its fullness but future generations will and that is reason enough to invest in tomorrow. Someone down the road will be grateful for this gift from the past. The thrill I feel is akin to secretly leaving May baskets for neighbors. Such fun. 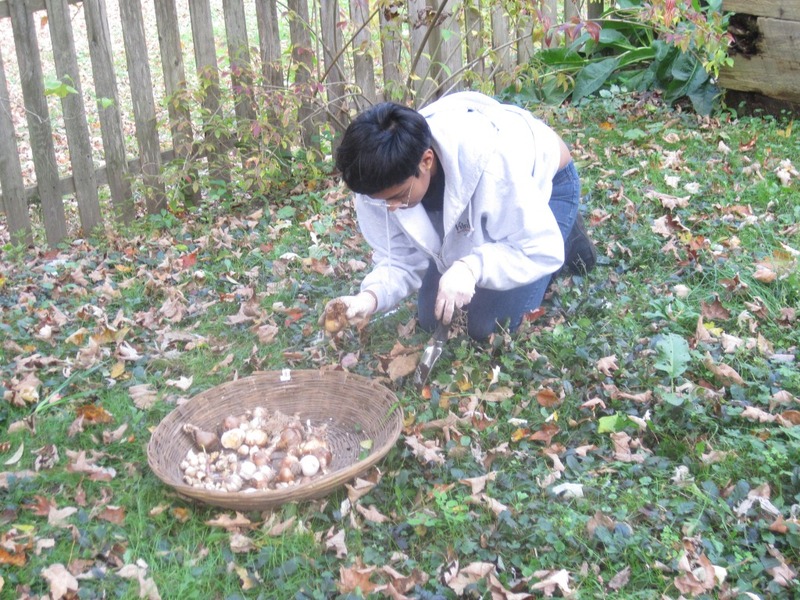 Even as I gather the freshly raked leaves, I’m thinking about the rich compost they will make to feed the plants next growing season. That thought permits my arms and shoulders to bear the aches and soreness as a badge of honor and continue the work with renewed vigor. Optimism is a powerful motivator. 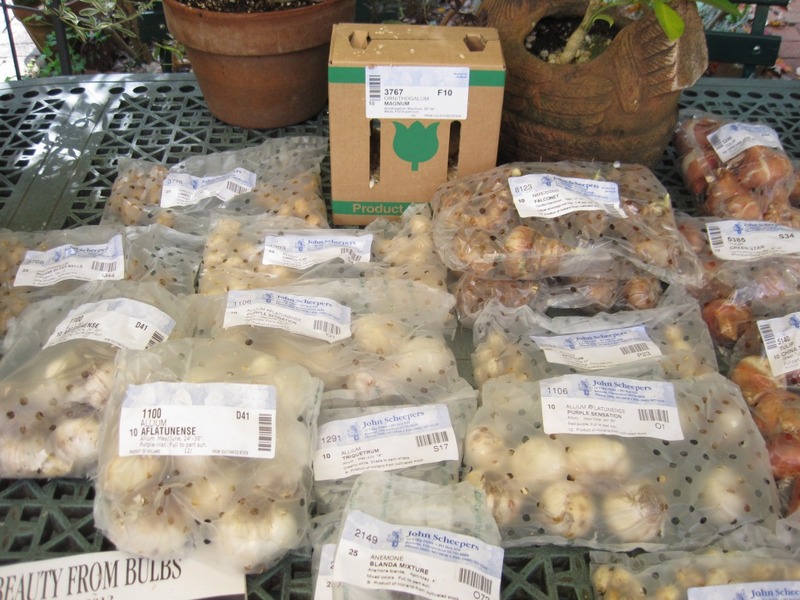 The bulbs I ordered in mid-summer have arrived just in time for fall planting. Innocuous brown packages in a variety of sizes. Its just incredible that they contain what will become some of the most beautiful sights of spring and summer. To hold a bulb in my hand is to hold a miracle. Now my heart is truly aflutter. I’m positively ecstatic. 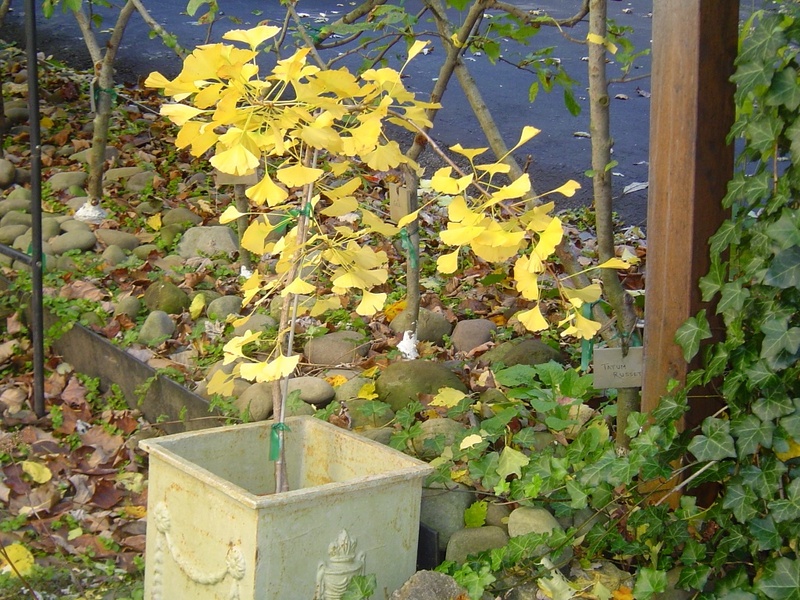 The fall offers up a chance to do over parts of the garden or even the entire garden. Its as though past mistakes are forgiven, new chances to try something different are presented. Suddenly I’m attacking my chores with enthusiasm and ardor. I savor the colors of autumn and inhale the crisp, cool air. I feel truly alive. A new energy has infused my spirit and the winter ahead is no longer dreaded. I’ll use up that season with garden dreams and plans. And I’ll wait with restrained impatience for spring. I see hope, potential and possibilities everywhere. Pollyanna lives! I cut the last of the ‘Heritage’ rose and bring the fragrant flowers to cherish indoors. The first frost is expected tonight. Continue patrolling for weeds. As long as there is no frost, the weeds will keep thriving. Get lawns freed of thatch and reseeded. 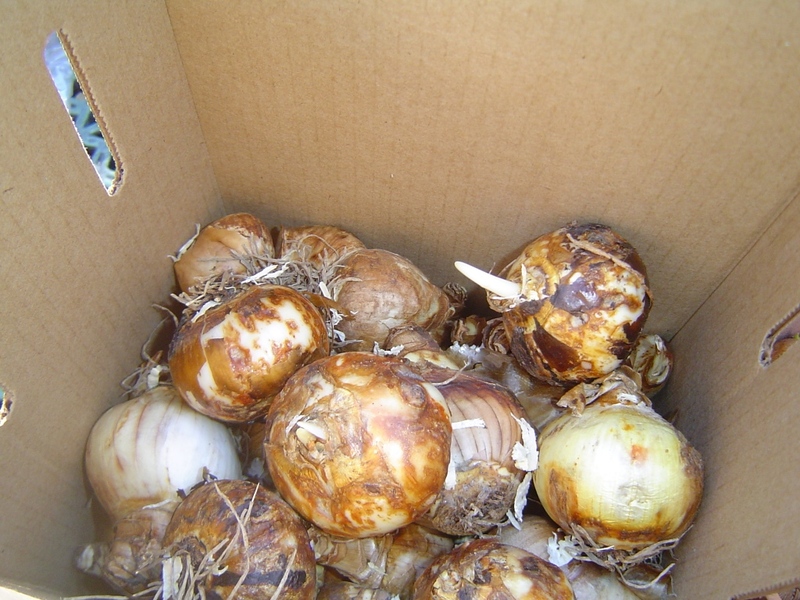 Start planting bulbs for spring once weather gets properly cold but before ground freezes. Usually end of October and early November is the ideal time. Get rakes, leaf bags and such ready for tackling fall leaves. I leave some leaves for mulch but still need to rake a good deal. Raked leaves are deposited on a compost pile in the woods. 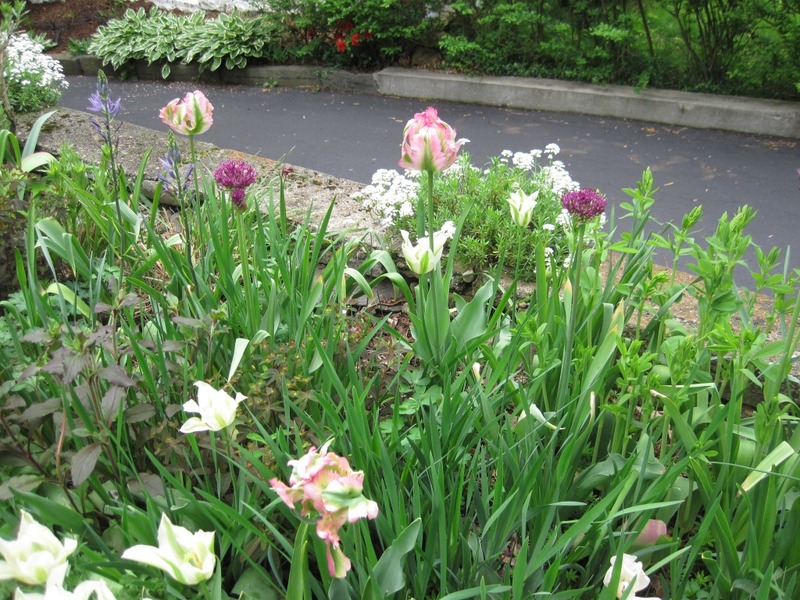 Begin cutting back perennials and clean up garden beds. Fall is the season to plant most perennials. Divide and replant or purchase new ones. Secure climbers like roses so limbs are not damaged in winter storms. At this time, remove all dead wood. This is a good time to take inventory and see what needs to be repaired, replaced, renewed or redone. Think plants such as shrubs and trees, paths, walls, patio furniture, trellises and arbors. Schedule what gets done now or can wait till spring. Knowing what needs doing, what is required, how long it takes and how much it costs goes a long way. Otherwise, it gets overwhelming. And often, over-budget. Enjoy the autumn flowers and colors. My asters are currently running riot and make me smile . I’ve also been bringing in hydrangea for dry arrangements. A big bunch in a large, white ironstone pitcher makes a simple and dramatic statement.